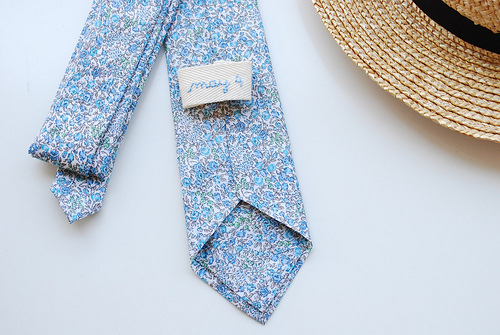 I can’t believe the Hunt & Gather Trunk Show is this coming Sunday! Even though we always plan it months in advance, it feels like it has totally snuck up me. As always, we’ve managed to round up a stellar group of vendors who will delight you with their handmade and vintage goodies. I really hope to see you there. This week, I’ll be continuing my trunk show tradition of introducing you to a few of our lovely vendors. 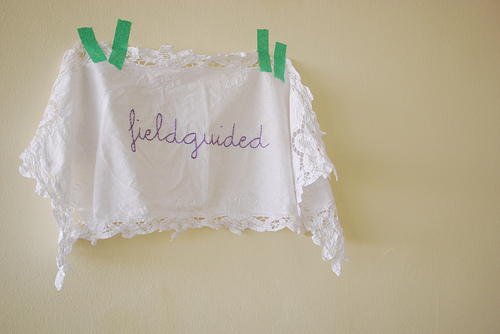 Today it’s one of the sweetest couples in town, Anabela and Geoff, also known as Fieldguided. Anabela sews and embroiders while Geoff creates drawings and together they go thrifting. It is well known how much I am inspired (shameless copycat?) by Anabela – her books, the patterns she makes, even the sandwiches she eats! It’s going to be so much fun going through their trunk at the show! Geoff, if you had to describe Anabela using 3 nouns what would they be? Anabela, same question. Geoff for Anabela : Kittens / bows / lace. Anabela for Geoff : Cardigans / countryside / home. Anabela : The funny thing is that I never used to like thrifting. I had many unsuccessful trips in high school to the Buy the Pound that used to be on Jarvis. Now I follow two rules: one is that if I have the urge to go, I go. I find it so enjoyable that I try to go when I’m in a bad mood. The other rule is that I have to purge often: one box of stuff in, one box of stuff out (roughly). I remember seeing the home of one of the designers from Libertine in Domino magazine; he had a dedicated Goodwill area in the hallway. I think that is a great idea! I don’t mind giving away something I once considered a great find, because someone else might feel the same joy of discovery later on. I love that thought. I also have a fantasy of doing a thrifting roadtrip — I bet the American south is filled with treasure. Geoff : I don’t often make as many purchases as Anabela when we go thrifting but I enjoy myself just the same. I’m always looking out for nice clothes and never give up despite the fact that the ‘small’ section of mens’ dress shirts usually means 5 shirts. I also love looking at old books. Some of my favourites are the 1950s school text books that I seem to find with great frequency. I have an unexplainable interest in vintage tableware, and once I nearly bought a complete set of dishes, including cups and saucers, that were in a line owned by my late grandparents. Is there something that either of you have been hunting for but have yet to find? Anabela : I’m constantly on the hunt for older pieces of clothing, which is diffcult. Even if I can’t wear them, I love the structure of dresses from the 1950s and earlier, and want to collect them. Now that the weather is warmer I would love to get my greedy mitts on some cotton day dresses and delicate cotton blouses, beautiful cocktail hats, floral headpieces, old saddle shoes, etc. All these things remind me of books I have loved. It would be nice to be able to find genuinely vintage items, rather than the usual polyester — not that I don’t love disco dresses! 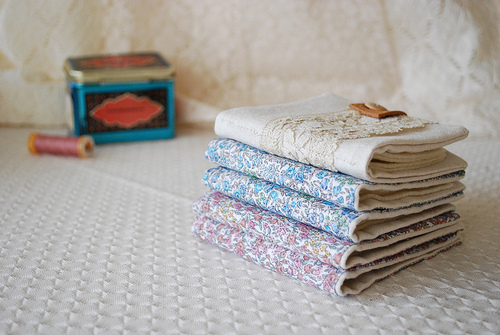 Other things I’d love to find (or find more of): floral barkcloth, antique vanity sets, pretty tins, old photographs and slides, and children’s porcelain tea sets. I am also hunting for a good way to find out about estate sales in the Toronto area. Geoff : The search has settled down, but for a period last year I was on a hunt for vintage analogue cameras, including Polaroids, Twin Lens Reflex cameras, or old rangefinder cameras. I found about six different Polaroid cameras including a 360, a peel-apart film style camera that I still haven’t used, and two SX-70s. I bought a TLR off someone through Craigslist, but did manage to find a nice rangefinder at Value Village, a Yashica Electro. What is your favourite meal to have together? FG : We love cooking together at home, but we also have a variety of inexpensive restaurants that we like to visit on occasion (the old standbys). Brunch is always a favourite, especially if it includes sweet potato fries. 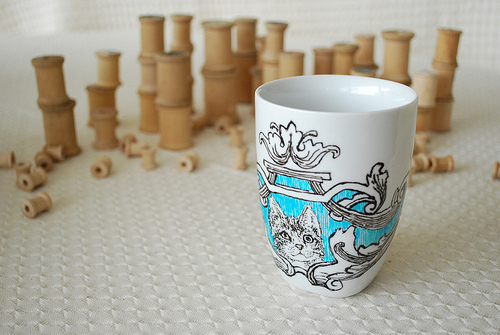 What sorts of treasures will you have at the trunk show? FG : We will have a selection of things from thrift shops and antiques malls: picture frames, tableware, skirts, dresses (including a pretty shirtdress from the 1960s with a Built By Wendy-ish axe print on it), shoes, caridgans, blouses, as well as some sewing supplies: lucite purse handles, appliqués, doilies, patterns & books, and more. We’ll also have some of our handmade items, including headbands, sashes, handpainted mugs, embroidered drawings, and tote bags. Such a lovely interview. They’re both gems! I can’t wait to see the treasures Fieldguided has for us! I really enjoyed the interview also. You inspire me too, missy!